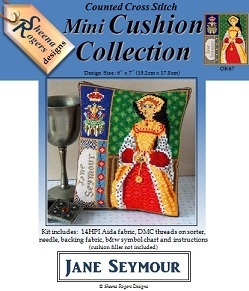 Stitch a slice of Tudor history with this mini cushion design of Jane Seymour, Henry VIII's third wife. Jane Seymour was Queen of England when she married King Henry VIII on 30th May 1536 but her reign lasted less than two years as she died on 24th of October 1537 of postnatal complications withing two weeks after the birth of the only son, who would later become King Edward VI. This triptych design features a portrait of Jane, set against a tapestry-style background, with a second panel of the badge of the Queen (being a crowned Phoenix (symbolising rebirth) rising from a Castle (representing safety and spriritual power)) plus a third panel with her name and a mini Tudor Rose border.